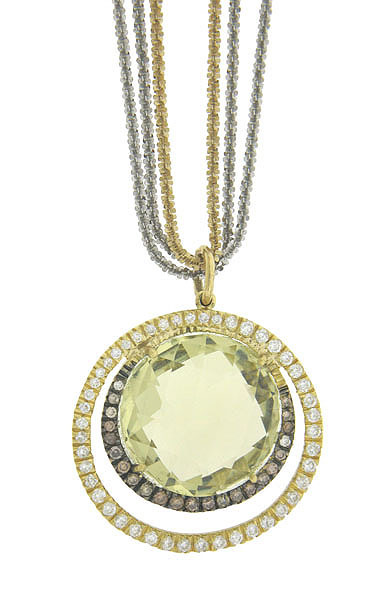 A sparkling round cut lemon quartz glows from the face of this antique style pendant/necklace. The multi-faceted stone is surrounded by a ring of champagne diamonds, while a larger ring of fine faceted diamonds encircles the dazzling yellow quartz. Stacked petals form the jewel like yellow and white gold chains that hold the dazzling pendant. The pendant measures 1" in diameter. The triple chains are 17" in length.